Let me explain. ... No, it is too much. Let me sum up. Kazuya Minekura's Saiyuki is a fabulous manga, but due to publisher switches and long hiatuses, it has never quite made it to the world of animation without some major confusion. The manga is composed of four series: Saiyuki, Saiyuki Reload (which continues from the end of Saiyuki), Saiyuki Reload Blast (which continues from the end of Saiyuki Reload), and a Prequel series called Saiyuki Gaiden which stars the previous incarnations of the series' main characters. Confused yet? We're only getting started. If you are coming to the Saiyuki anime for the first time, the place you'll want to stay is Gensoumaden Saiyuki (or just Saiyuki), the original anime. 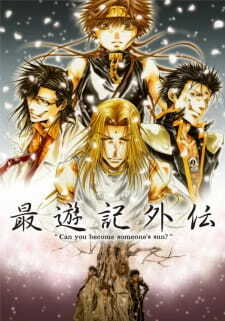 It is based on Saiyuki (the manga) and includes roughly the first half of Saiyuki Gaiden. The next anime series, chronologically, are Saiyuki Reload and then Saiyuki Reload Gunlock, which cover up to the middle of the Saiyuki Reload manga. Basically, tldr, if this is your first taste of Saiyuki in any form, you're gonna be very, very confused. These OVAs are mostly for established fans of the manga. That said, as an established fan of the manga, I've never been satisfied with the anime adaptations. For one thing, as you can see, they're overly confusing and brimming with filler. I also have noticed that Minekura's art seems difficult to adapt to anime--the animation is horrendous at worst, vaguely weird at best. Saiyuki Gaiden is some of the best animation Saiyuki has gotten, but it still looks kind of off, as if her anatomy isn't quite made for moving. Not my favorite. That said, I do recommend the manga whole-heartedly. I highly recommend Saiyuki Gaiden. Story wise the Gaiden arc is amazing and definitely my favorite Saiyuki story. It's by far my favorite prequel and one of the best i've seen. It has a brilliantly touching plot that leaves me crying every time, and the character relationships are heart breaking and beautifully depicted. The Gaiden left a strong impact on me, its the type of story that you keep thinking about hours, even days after you've seen it. The anime however, is not as good as the manga but still a great watch. The Gaiden arc actually starts in Saiyuki episode 40 and 41. So you should watch those two episodes before watching these OVAs. Other than that it is not necessary to watch Saiyuki or any of the sequels before this, though I suggest you do because the whole series is great :) Saiyuki Burial is next in chronological order. I have not come to give an analytical review. No, that is not why I’m here. This left me sobbing, I’ve genuinely never been such an emotional wreck before. The story is definitely my favorite in the Saiyuki world, the characters are incredibly well-done. Definitely more bloody than most of the series in general, though given the entire arc as a whole, what did you expect? Given that this was an OVA, the pacing is fast and can be somewhat chaotic if you’re not totally concentrated. Personally, I would recommend watching at least episodes 40 and 41 from the original series. Though if you really want to be a sobbing puddle on the floor, the whole series. Long story short, I need emotional help now.